Dr Paul Anderson is the Prince Alwaleed Lecturer in the Department of Middle Eastern Studies at the University of Cambridge, the Assistant Director of the University’s Prince Alwaleed Centre of Islamic Studies, and a Fellow of Darwin College, Cambridge. 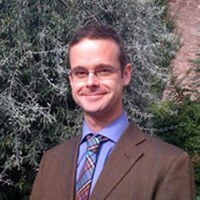 Dr Anderson is a social anthropologist interested in the articulation of economic, moral and religious life. His research has a particular focus on Islam, value, moral personhood and the sociality of trade. He has conducted ethnographic fieldwork in Syria and China, and is currently part of an ERC-funded research project studying the global trade in low-grade Chinese commodities. He is also working on a monograph of Aleppo as a trading city before the outbreak of the current conflict in Syria. At the University of Cambridge, he teaches courses and supervises research on the anthropology of the Middle East, and the anthropology of Islam. This project explores the moral and social dynamics of trade in the city of Aleppo, then Syria’s commercial hub, before the outbreak of the Syrian uprising in 2011. It starts from the assumption that Aleppo was not simply a second city to Damascus, nor a site of political opposition to the Baathist regime, but had been fashioned by Aleppo’s merchant families into a dynamic node in an expansive Asian economy, connected to markets in China, central Asia, the Gulf and beyond. As well as identifying these connections, this project seeks to describe the local understandings of economy, value and circulation in which trade in Aleppo was embedded. Drawing on fifteen months of fieldwork in Syria, conducted in 2008-09, this project explores the forms of value, dynamics of trust, and notions of moral personhood, that underpinned trade in Aleppo’s wholesale and retail suqs and textile factories in this period. Another strand of my current work aims to describe the dynamics of long-distance trading networks connecting China to markets in West Asia and Arabic-speaking countries. It is part of a European Research Council-funded project, led by Professor Magnus Marsden, entitled ‘Trust, Global Traders, and Commodities in a Chinese International City’, documenting the trading networks and activities centred on the city of Yiwu in south east China. The focus of this work, which is also supported by the Centre of Islamic Studies, is on the history of trading routes between China and the Arab world, the social dynamics and identities, and forms of trust/mistrust underpinning these long-distance trading networks.